Leftover Espresso Grounds Brownies | Reuse those coffee grounds! Leftover Espresso Grounds Brownies, a rich fudgy brownie recipe made with leftover espresso grounds. 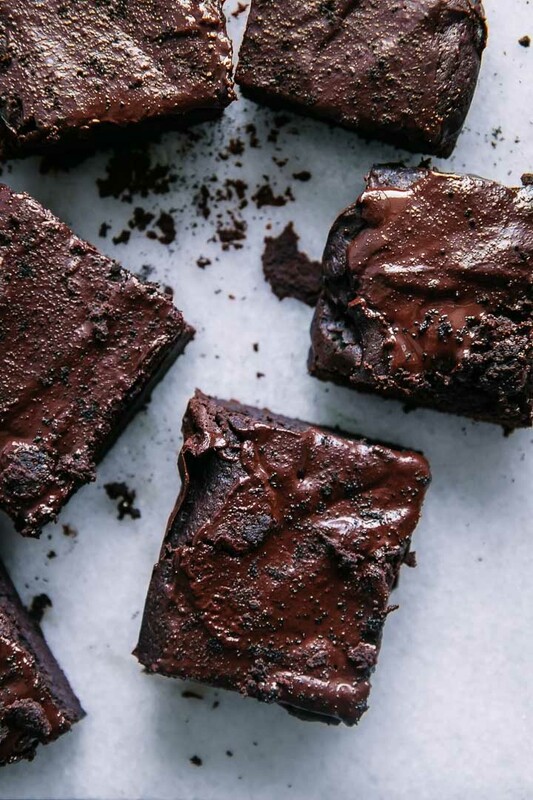 Reuse those coffee grounds for a deliciously moist chocolaty treat! While I’m a chocolate connoisseur, there is one thing I do love more: coffee. But what I don’t love about coffee is throwing out the perfectly good coffee grounds each and every day. So recently I challenged myself to experiment in the kitchen with espresso grounds to see how I could create recipes that would reuse the grounds that would typically go to waste. And that’s how these moist and rich Leftover Espresso Grounds Brownies were born. Do you have leftover coffee grounds that are begging to be saved from the compost bin and reused? Then look no further, this food waste rescue recipe will put those grounds to work! Are you ready to learn how to make this homemade espresso brownie recipe? Let’s do it! 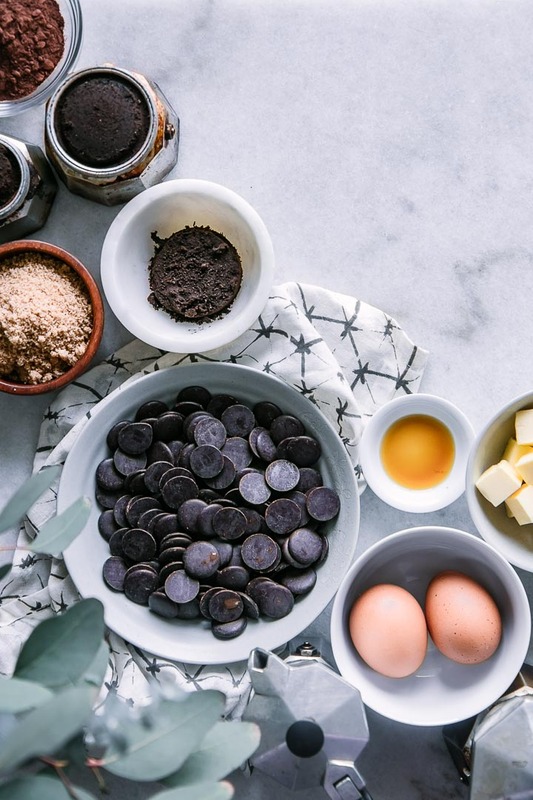 First you will preheat the oven to 350 F and prepare an 8 inch by 8 inch pan with either oil or line with parchment paper, then set aside until brownie batter is ready. Next you will melt the butter in a small sauce pan over medium-low heat, then slowly stir in the chopped bittersweet chocolate. Stir continuously until the chocolate is melted, but be careful to keep heat low so the chocolate does not burn. 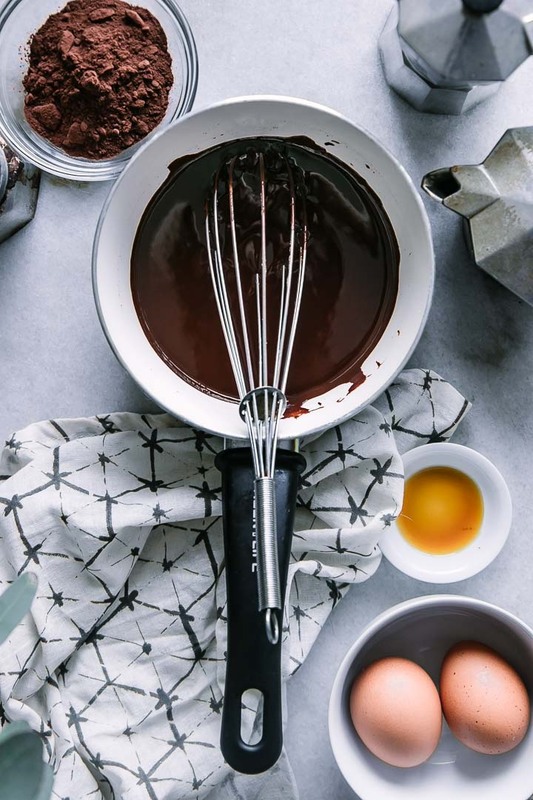 Add brown sugar and espresso grounds to a large mixing bowl and then slowly pour in melted chocolate and mix with a handheld mixer (alternatively you can also use a KitchenAid mixer). Add in your eggs one at a time until the mixture is well combined, then add in cocoa powder, flour, salt, vanilla, and espresso (or coffee) and mix until smooth. Finally, pour the batter into the pan and baker for about 30-35 minutes, or until your fork comes out mostly clean from the center of the brownie pan. 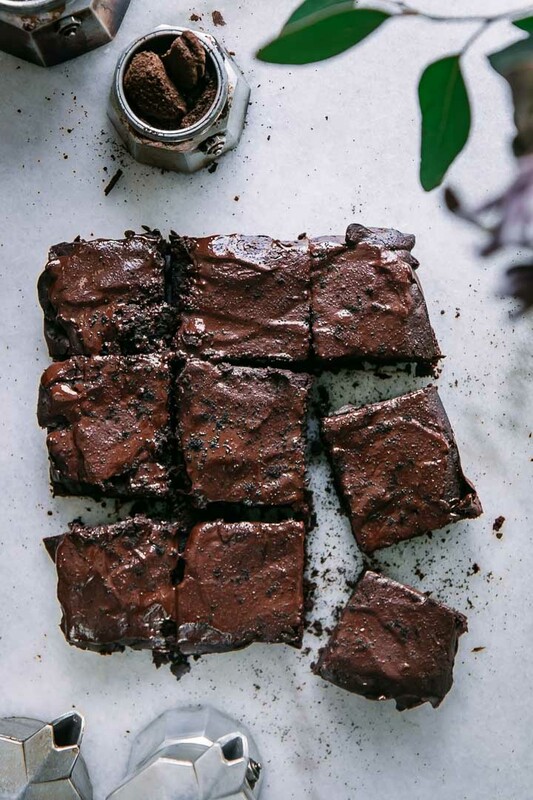 For the chocolate drizzle topping, melt chocolate in a small sauce pan and drizzle over brownies in the pan after baking and sprinkle with espresso grounds. Then enjoy this deliciously rich mixture of coffee and chocolate! To save coffee or espresso grounds: save coffee or espresso grounds in a small airtight container stored in the refrigerator until ready to use. Love this simple espresso brownie recipe recipe? Check out our other seasonal sweets recipes, like this Saffron Poached Pears or Baked Brie with Figs and Maple. 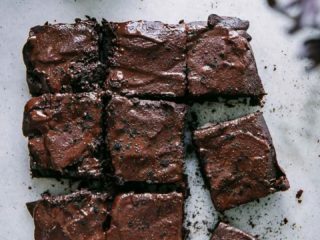 Did you make this Leftover Espresso Grounds Brownies? Leave a comment below and rate the recipe to let us know how it turned out. Save this brownie recipe for later by pinning to your favorite desserts Pinterest board and make sure to tag me on Fork in the Road’s Instagram to show me your coffee brownie creations! Preheat oven to 350 F and line an 8″x8″ pan with parchment paper. Melt butter in a small sauce pan over medium-low heat. Add in chopped chocolate and stir until chocolate is melted. In a large mixing bowl, add brown sugar and espresso grounds. Slowly pour in melted chocolate and mix with handheld mixer. Add in eggs one at a time until well combined. Add in cocoa powder, flour, salt, vanilla, and espresso, mixing until combined. Pour batter into pan with parchment paper and bake about 30-35 minutes, or until a fork comes out mostly clean from center of brownie pan. For chocolate drizzle topping (optional): melt chocolate over low heat in a medium saucepan, then drizzle over brownies and sprinkle with espresso grounds. Notes: if you don’t have parchment paper, you can also just grease the pan with butter or oil. If you use a 9″x9″ brownie pan, reduce cook time by five minutes. Leftovers and Storage: store brownies in an airtight container at room temperature for up to five days. 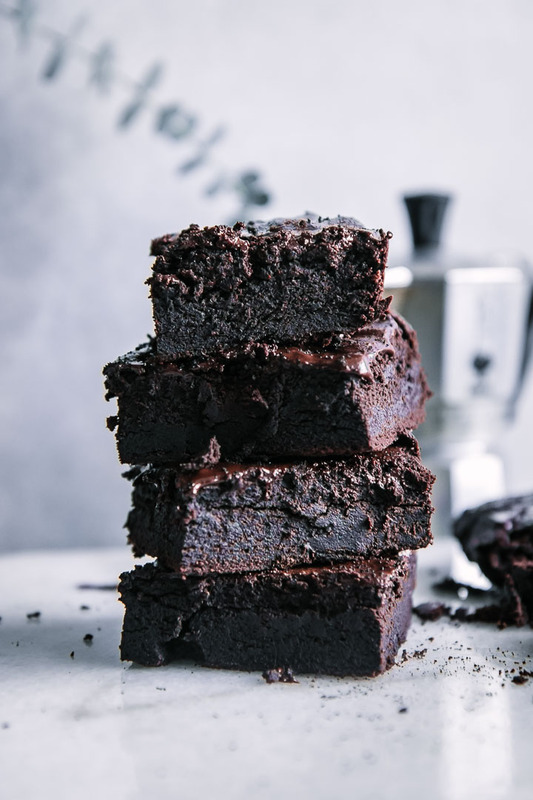 Nutrition notes: these espresso brownies are high in sugar and fat, however they are intended to be an occasional treat and you should enjoy and savor them as a part of a healthy balanced diet. Also note, this recipe does contain coffee, which also contains caffeine. These sounds so good! Often I have thought there must be more than one way to use spent coffee grounds. I’ll definitely have to try these! That’s great! Yes, I’m always on the lookout for how to reuse foods in the kitchen. My recommendations with the coffee grounds is to make sure they are finely ground, a larger grind will make the brownies mealy and grainy. Let me know how they turn out!